The largest development in the history of Jefferson Parish, and the one having the biggest impact on the future of New Orleans, is the development of the $807 million dollar north terminal at Louis Armstrong Airport, which will include a 140 room hotel on land leased from the city. CityBusiness recently interviewed Robert Hand, president at Louisiana Commercial Realty on the hotel development. 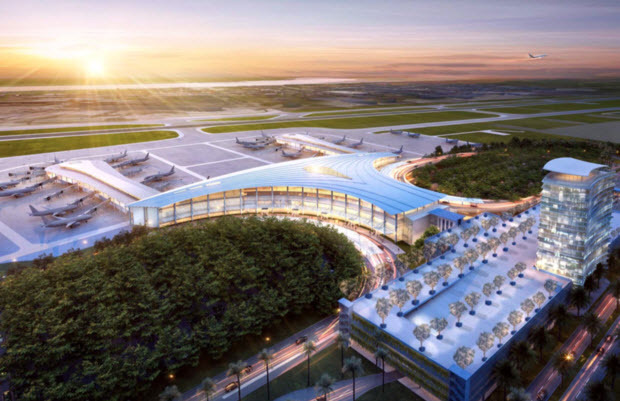 Louis Armstrong International Airport doesn’t plan to scrap plans for a hotel near its new $807 million passenger terminal despite receiving no interest from hotel developers. The New Orleans Aviation Board did not receive a single response to its recent request for proposals to construct an on-site, three-star hotel next door to the terminal currently under construction. The deadline for responses was Sept. 16. Robert Hand, president of Louisiana Commercial Realty, said the 140-page RFP makes a hotel not feasible due to the payments required by the city. At a 140-room hotel, the average room rate would $125 per night, which would amount to $6.3 million in potential rental income. But Hand pointed out that hotels don’t operate at 100 percent capacity. “They plan for 60 percent, so pro forma revenues are $3.8 million, which is the effective rental income,” he said. Expenses are 60 percent, which means 40 percent is left, or $1.5 million, the net operating income. If a developer paid $100,000 rent for the land, plus a $450,000 fee, that would amount to 35 percent of net operating income, leaving approximately $1 million before income taxes which are around 35 percent. The resulting income to the investor is $650,000 annually for a $17 million investment which is a 3.8 percent return on investment, which doesn’t compensate investors enough for the risk, Hand said. Hand recommended the board reduce the guarantee fee based on profits, offer financing since they are a government entity and rates would be below market, and lease more than 22,000 square feet so construction costs would be less. Requests to interview Iftikhar Ahmad, director of aviation at the airport, have not been returned. Several aviation board members did not return messages seeking comment. According to the original RFP, the nationally branded hotel must include at minimum of 140 rooms and embody the terminal’s design by architect Cesar Pelli. Preliminary architectural renderings of the proposed project must include two different aerial views, a typical guest room, lobby area, restaurant and meeting area. The proposal will be judged on its aesthetic and functional compatibility with the North Terminal design as described within the RFP. The selected proposer will lease the hotel development site – about 23,000 square feet – from the NOAB for the term of a 30-year lease. The airport had wanted to consider bids beginning next week and sign a lease by a lease by Dec. 16. The terminal is scheduled for completion in October 2018.